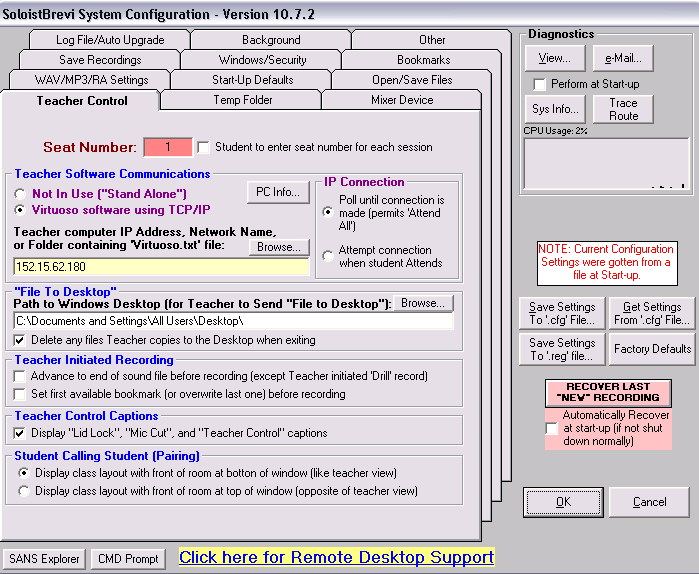 Teachers using a fully computerized classroom – as well as the installed language learning software itself (which, once set up, will help further by displaying the names of the students logged in on the student computers), – need to have an easy way to identify and address individual student computers. 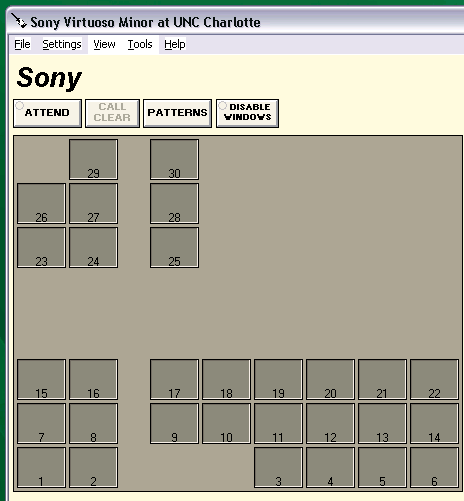 Sony Virtuoso/Soloist, like the Sanako Lab 300, use an identification scheme which based on manual numberin of te student computers. 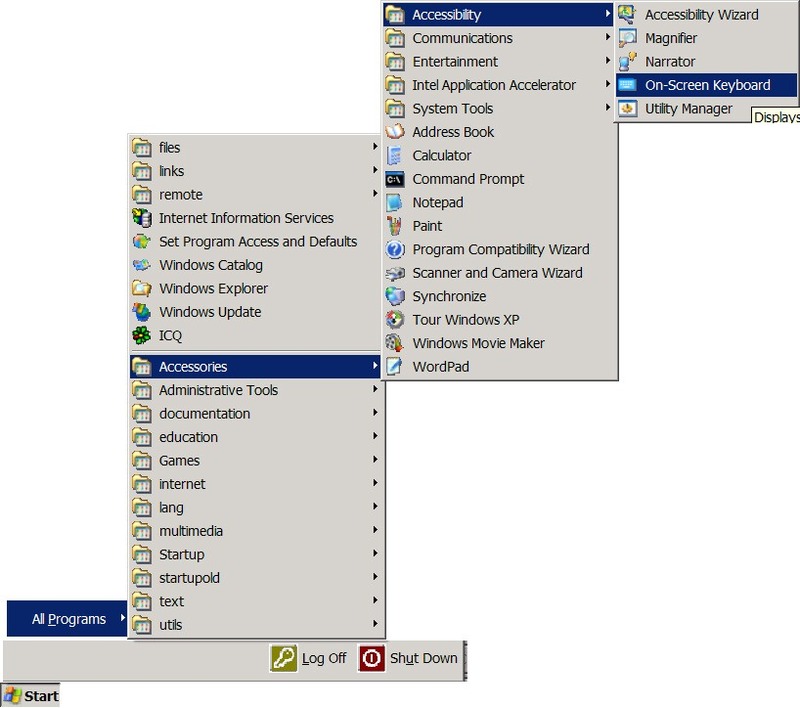 This requires the administrator to manually make a configuration change on each student computer when the software is first installed (and whenever the classroom is reimaged with upgrades). 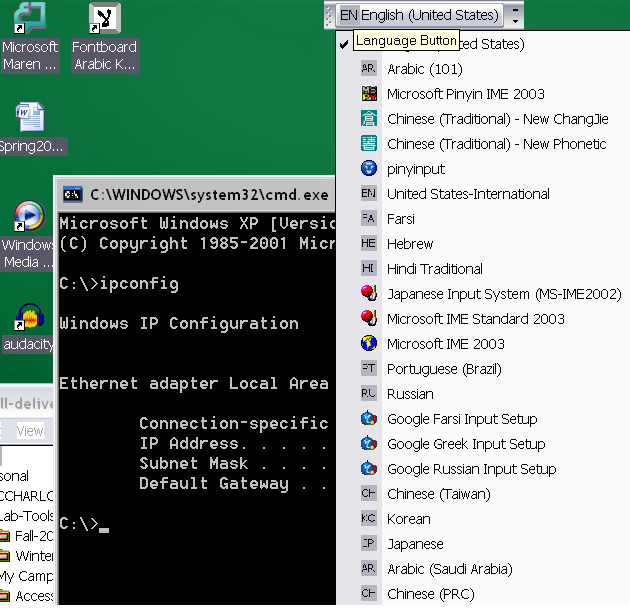 Newer classroom mangement and langauge learning systems like NetOp SChool or Sanako Study can autonumber and –identify connected student computers. To set up the student computers, start the Soloist from the desktop icon. in the text input field Seat number highlighted red above, put the number that corresponds to the attached seating map below. NOTE: the seats in the center bottom forming a dent in the layout are intentionally left blank for he presenter computer and PC32. The square in the upper right are the leftmost (teacher perspective) computers in our main lab – they would not fit better into the lab layout grid of the Sony Virtuoso Apprentice (higher versions have more flexible layout grids, I hear). 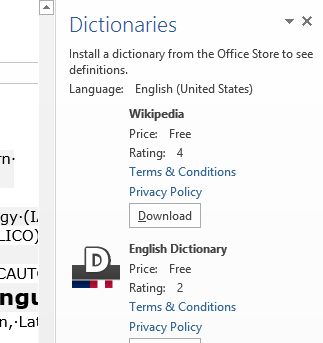 I have been meaning to find a screenshot software that can show the entire portion of a window – including the “scrollable” portion, i.e. more than the visible. A long time ago, I used to do this with HyperSnap, but this software is not free. Limitation: Screengrab requires you to access the context-menu on the page via right-clicking – some web sites prevent this! You can do minor updates using the file manipulation features of Ghost Explorer (you may have to recompile the image, which adds some time – but not necessarily, even for registry changes – and is still faster than the checklist). Load the image with Ghost explorer. Browse to a file. Right-click the directory or file to get options. Or simply drag and drop files between the host file system into the Ghost Explorer. 1. Run Regedit.exe from the new installation of Windows, and then click theHKEY_LOCAL_MACHINE key. 2. On the File menu, click Load Hive. 3. Open the %SystemRoot%\System32\Config folder of the original Windows installation, click the System file, and then click Open. 4. In the Load Hive box, type test, and then click OK. The original Windows installation System hive is loaded as a subkey of the current HKEY_LOCAL_MACHINE registry key as "test". 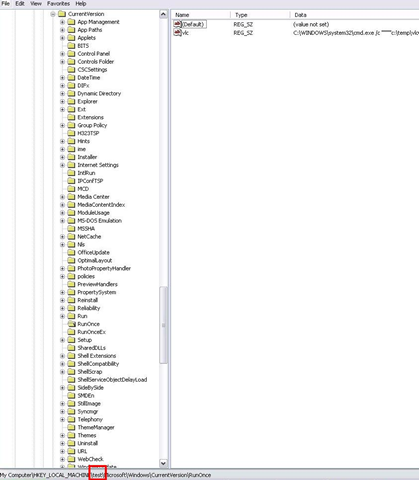 a. Click test, and then click Unload Hive on the File menu. b. Click Yes to confirm the unloading. Clone/deploy as normal: Easy, fast. Good luck. What about improving language learning through technology during homework activities? “The greatest strength of WebSwami lies in the seamless support it provides for doing audio/visual-based tutorial activities within an existing course management system, thus allowing anywhere/anytime access for lesson designers, instructors, and students alike. Its student record keeping system, in particular the integration [duplication] of a grade book with direct access to student responses and the support it provides for multimedia response feedback, far surpasses what is available in any other virtual learning environment. Most important, it manages all of this through well established, reliable, web browser and Flash software coupled with ubiquitous, inexpensive web camera hardware.” (review by Jack Burston for CALICO (pay-link, ask me for access); see also also the freely accessible review by İlhan İnçay). Authoring and managing authored materials is not an easy task, but gives more flexibility than using textbook provided materials. WebSwami promises the possibility of exchanging learning materials through a materials bank. View a recording of a recent WebSwami Online Demo. 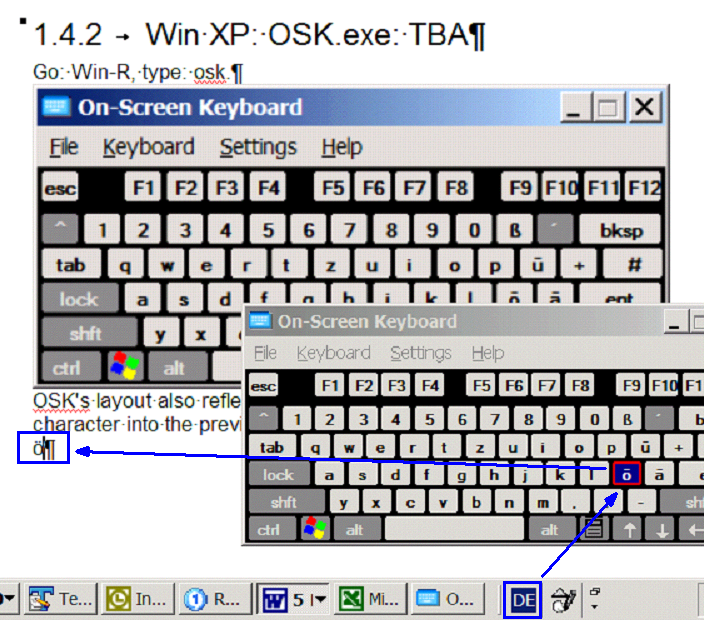 You can also use the windows on-screen keyboard to input non-Western characters on a computer that has not the corresponding keyboard overlay stickers. 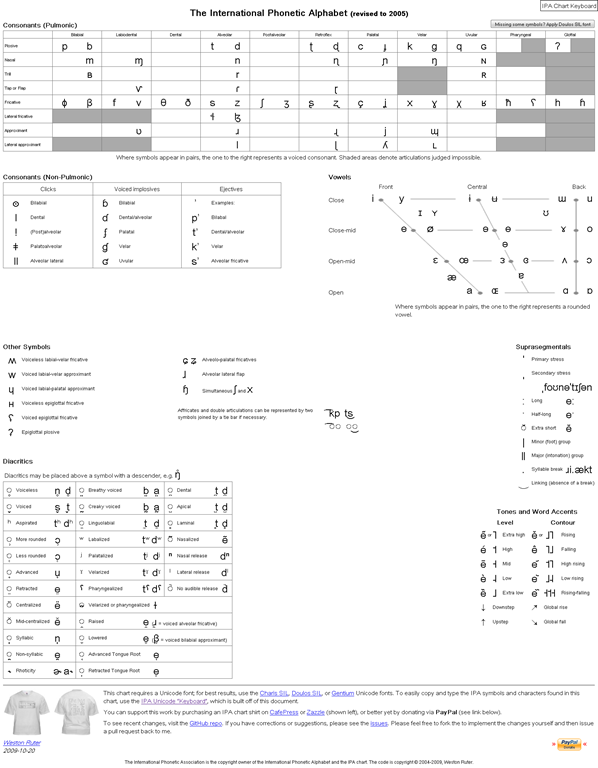 In the small-group workspaces, which have writing pads, you can also use the MS-Handwriting IME for East-Asian languages.